First of all, I know you can hear the beat to ice, ice baby in your head!!! We’re having an ice storm in Oklahoma! It’s not as bad (at least so far) as it was back in January, but it is dangerous! We went to first service at church this morning (at 8:15), by the time we got out the weather was getting worse so we headed to Braums for milk and then home for the day since church was cancelled. Since Joey is a principal at a small private school (Most of the public schools are cancelled, so they are too! ), he needed to get out & test the roads. I wanted to get out of the house so we went along. We headed to Target for a few things. It was really nice there was hardly anyone there. Jaxon had a blast playing in the toy isles without the crowds. Well, our lights keep flickering, I think we’re about to lose power…I better go! Looks like we’ll be all cuddled up tonight! Here’s the video I promised the other day! We received a package in the mail w/ bubble wrap. It was his first time to pop the bubbles! What can I say, that’s what he remembers about Christmas so far! Kids say the darndest things! A first for me…and something new! “I get toys”!!! LOL!!!!! What a cutie!!! 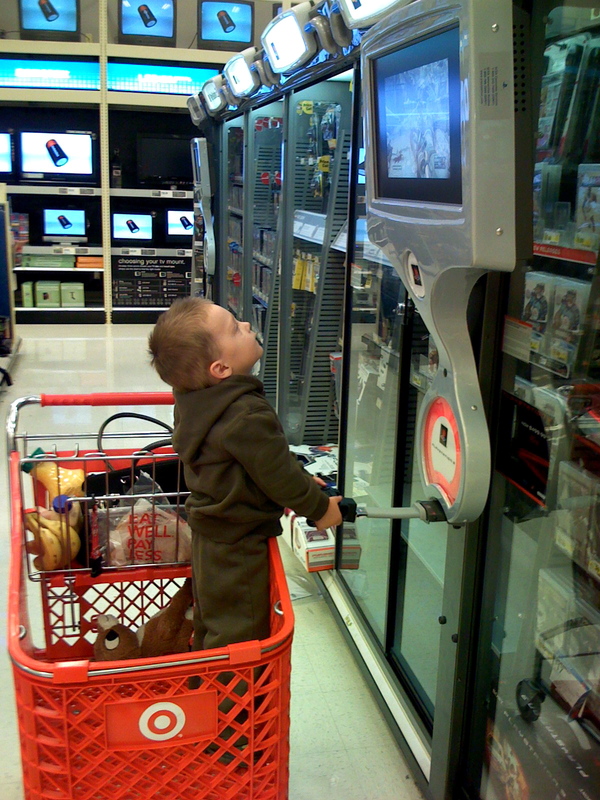 I LOVE the pic of him in the cart at the playstation! That’s a boy for ya! They had our roads cleared for work today…but I’m thinking that tomorrow may be an ice day for us. I’m just hoping that we don’t get so much ice that we lose power! They’re predicting 1-2 inches! YUCK!!!! It’s not fun to stay home for the day when you don’t have power! That is hilarious! He is sooo cute! Oh my gosh, that is the funniest thing ever! He is SO cute! Now if that isn’t the cutest thing EVER!!!! I loved it! Thanks for sharing! P.S. I am glad to see that you are still with Chase! I thought of you the other day when the LO for my hubby’s branch pretended she was Mis. Clause on the phone with my little Brooklyn because she had done something wrong. My first thought was if Suzanne lived in SLC she could have played Mis. Clause instead! Oh my gosh my side hurts. That kid is hillarious. I hope you guys are doing well and staying warm. That was the cutest thing! “I get toys” That was hilarious! If there were every a clone of Joey it would definitely be jaxon! He always made me laugh and he could melt your heart with those little hold me tricks. Susie u r a wonderful mommmy and Jax and Joey are Blessed to have you in their lives. I meant to say “If EVER” not every LOL!!!!!!!!! i love your laugh!!! and the bubble dance! and the fact that Jax suddenly got scared and needed his mommy to hold him (what a nice feeling, it’s so great to be needed!!) cute!